As I wrote earlier, Mary Margaret Hansen is working with the architects of the new Houston Permitting Center to load the place up with art. She details the progress on her blog on the subject, Artful Interventions. 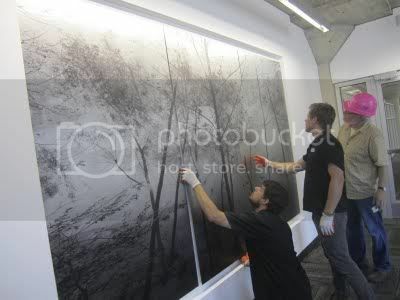 The photo above is from a recent post about photographer Geoff Winningham installing his three pieces, large photos of Buffalo Bayou printed onto aluminum. Winningham is still a photography professor at Rice (I say "still," because he taught me there as an undergrad--and that was a long long time ago--and he had already been teaching for over a decade when I showed up; in short, he has had an amazing career teaching photography). It is only proper that the city of Houston permanently install his work in one if its buildings. As I mentioned in another recent post, Winningham is involved in a Kickstarter campaign to raise money for art workshops for children that he and his wife do in Mexico and which they plan to expand to Houston. The name of this is the Pozos Art Project. Given the gutting that early art education has taken in this country in the past few years, this strikes me as vitally important. The good news is he is almost halfway to his $10,000 goal. The bad news is that they only have two weeks to reach it. So I urge you to take a look and make a donation, however small. Update: When I posted this at 6:30 am this morning, there were 21 backers of the Pozos Art Project on Kickstarter, and they had donated $4050 towards the total of $10,000 (as I recall). Now (9:30 pm) there are 25 backers who have donated a total of $5,250 (!) towards the project. The halfway point has been breached. One of those donating was my old college roomie, Hal Shipman. Way to go Hal (and all the backers of this project)! Update #2: With 10 days left and a few deep-pocketed contributors, the project is fully funded. Specifically, it has gotten pledges of $10,625 out of the $10,000 goal with 29 donors. Congratulations Geoff Winningham and Janice Freeman. Thanks for writing about Geoff's work at the new Houston Permitting Center. It is really beautiful. Can hardly wait for you to see the whole building. Opens to the public later this month.